With the GUARD-FS, MPL has integrated several systems into one housing, a Firewall, a VPN-Gateway, a Router, as well as an Ethernet Switch with your choice of copper and/or fiber ports. You can imagine the broad use of the GUARD-FS with this functionality. Today, everything is getting automated. Therefore security in this automated world is becoming more and more important. The key differences of industrial applications are that they require a long-term availability due to the life cycle management of the investments. 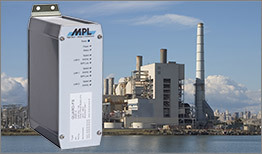 The system can be operated from -20°C to +60°C (optional -40°C to +85°C), without the need of a fan or case openings. The capability to offer copper as well as SFP ports for various fiber optical solutions make the product universal. This versatility is supported by the availability of a software development kit, the powerful 1.2 GHz ARM processor, and the 512 Mbyte built in flash that allows for customer specific extensions. 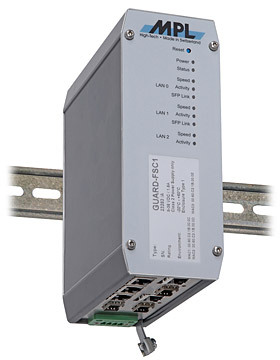 These features make the GUARD-FS to the ideal solution for industrial, transportation and defense applications where security, quality, reliability, low power consumption, and long-term availability are key. 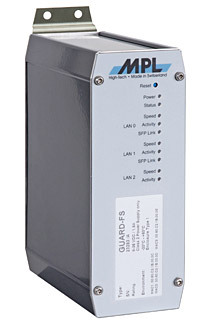 Just to name a few, the GUARD-FS can be used for applications such as remote monitoring & maintenance, secure communication in automation, etc.. 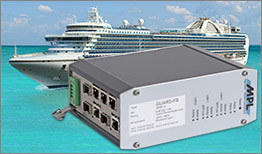 The GUARD-FS comes preinstalled with an adapted version of OpenWRT (www.openwrt.org). This Linux based embedded distribution provides all functionality required for operation as IPV4 and/or IPV6 firewall and router. The vast amount of additional packages available in conjunction with MPL support allows you to create a solution for every routing or firewall project. Most of the configuration of the firmware installed can be done using a web based interface. For more specialized requirements, a console based configuration utility is available. All configuration is stored on the device in a human friendly text format and can be modified using a text editor, too. GUARD 62-1 Ultra Compact Housing with internally chromated Aluminum and stainless steel plates. GUARD 62-2 Ultra Compact Housing with internally chromated Aluminum and stainless steel plates.